Why hike to Turtleback Dome? If you like the views from the El Capitan and Turtleback Dome & Air Quality webcams, you'll probably like the views from Turtleback Dome, since this is where those webcams are perched. Scenery Summary: The Yosemite Valley views to the east are similar to those from the Tunnel View, but from farther away and somewhat pinched off by intervening chunks of cliffside. 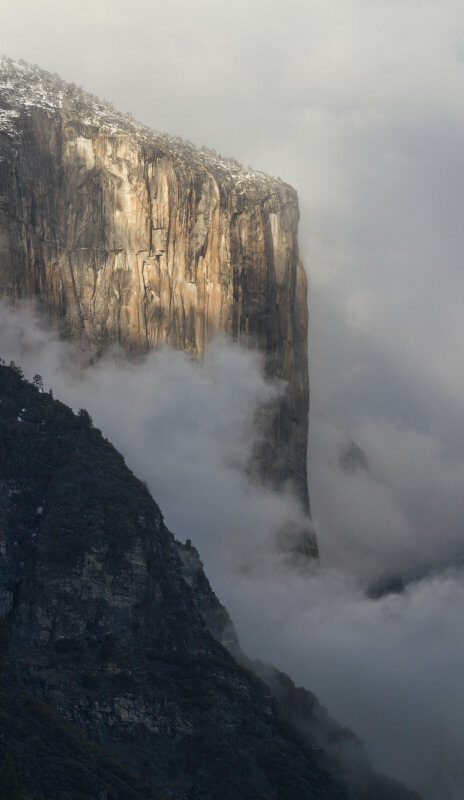 Bridalveil Fall isn't visible from most of the dome, for instance (only the topmost part of Cathedral Rocks rises above the fray), and Clouds Rest is mostly hidden by El Capitan. To the west you can see the High Sierra dwindling away into foothills, a view you don't get from the Tunnel View. It's not as spectacular as the eastern view to Yosemite Valley, but it is pretty at sunset. To the north you can see the top of The Cascades, a 600-foot waterfall, but seeing the bottom requires some intrepid bouldering. On the dome itself are various towers and sheds you can admire. Finally, for botanically-minded visitors, the highlight of Turtleback Dome is the presence of Yosemite Lewisia (Lewisia disepala). Best Time to Visit: The dome is accessible year round, but the views will generally be the most interesting during a clearing storm, when there's lots of dramatic mist rolling through the area and turning the vista into an ever-changing tableau. If you're here to see the lewisia in bloom, it's hard to predict exactly, but figure February or early March. If you're here to see The Cascades, this really isn't the best spot for it (more info here), but it's at its best in the spring. Crowd Factor: Low. It's not well known (and not really intended for hiker use), there's not much parking, and the views aren't as good as at the nearby Tunnel View, which diverts rockarazzi by the busload. The top of the dome isn't a large space, though, so if there are other hikers here, you'll be aware of them. Difficulty: Low with a soupçon of moderate - it's only about half a mile one way, but it climbs steadily all the way there, and you might have to stop periodically to keep your lungs from seceding. The trail is actually a service road, and consequently not particularly rocky or uneven. Parking: There's room for 2 - 4 cars at the trailhead, depending on how big they are and how creative their drivers get. The parking on the right side of the road (the Turtleback Dome service road, not Highway 41) requires climbing a short but steep bank, which will be awkward if your car has low clearance or the area is muddy. There are additional pullouts intermittently along Highway 41 in either direction. Nearest Bathrooms: Piquant pit toilets at the Bridalveil Fall parking area, 4 miles (6.5 km) back down the hill. For bathrooms with plumbing, you'll need to go to Yosemite Village in the east end of the valley, 9 miles (14 km) away. Nearest Snacks: At Yosemite Village, 9 miles (14 km) east. Food-Storage Lockers: None at the trailhead. 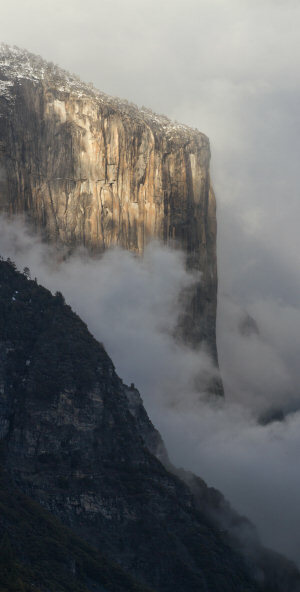 Getting There: From Yosemite Valley, drive south on 41; the trailhead is 2.1 miles (3.4 km) past the Tunnel View. If you're arriving from the south, it's 5.6 miles (9 km) past the Glacier Point Road turnoff. Here's a Google Street View panorama of the pullout. Trail Notes & Hazards: The trail is a service road that ends at the first set of sheds on the dome. At this point you'll have views west to the Merced River Canyon but not east to Yosemite Valley. There's a trail here that ducks around the buildings and continues a short distance to a section of dome that has views in all directions (and more sheds, lucky us). It shouldn't take long to find it. Have a look at the satellite view, on which the first set of sheds is plainly visible. Alternate Route: A mile and a half above the tunnel view tunnel is a pullout from which you can see the dome (it's the brown bald spot just visible at the top of this Google Street View) and hike straight to it. It's not so steep that you'll need to scramble or use climbing gear, provided you choose your route carefully, but it is plenty steep, and given the time you'll spend backtracking around obstacles and catching your breath, it's probably no faster than the regular trail. It's definitely more direct, though. Pivot left in the aforementioned street view, incidentally, to see a variety of Yosemite landmarks in the distance, including El Capitan (or the top of it, anyway), Half Dome, Sentinel Rock, Sentinel Dome, and Cathedral Rocks.